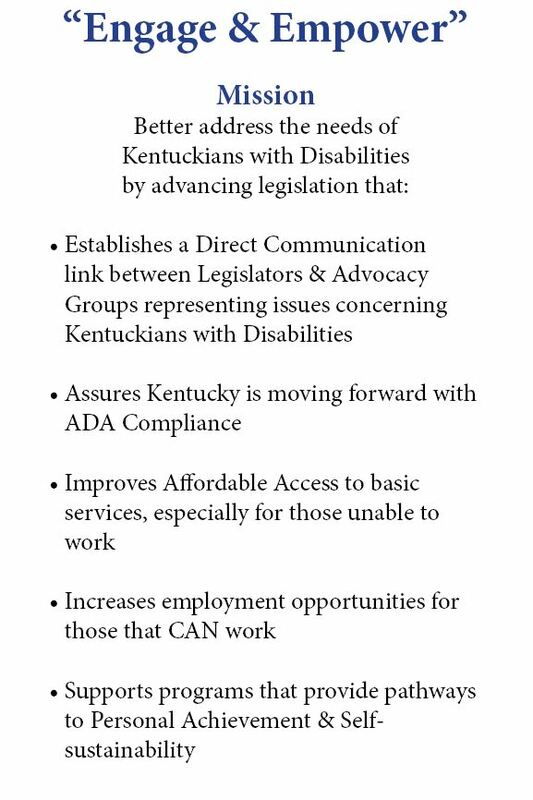 Frankfort, KY — A bipartisan group of legislators committed to helping Kentuckians with disabilities came together in the Kentucky House chamber today to announce that they were forming the “Engage & Empower Caucus.” It will be co-chaired by state Rep. Al Gentry, a Louisville Democrat, and Rep. Brandon Reed, a Hodgenville Republican. Both Reps. Gentry and Reed said they came together to form this caucus because they understand the challenges facing those with disabilities. Rep. Gentry lost an arm due to a workplace accident, while Rep. Reed has cerebral palsy. During the media event, the caucus highlighted about a half-dozen bills they’ve either filed this legislative session or soon will. That legislation includes HB 8, which is focused on dyslexia education; HB 150, a Golden Alert system for those with defined impairments; HB 180, which creates a similar Green Alert for veterans at-risk; HB 226, which establishes a farmer-focused mental health program; HB 228, which increases the homestead exemption for disabled veterans; and SB 20, which would establish treatment and restraint rules for children with developmental disabilities.